When we moved into this home, the back yard was for the most part, an asphalt drive way. I wish I could add more pictures of the before and after because the difference is staggering, at least to us that endured the old backyard. The old deck was a step down from the house and was an eye-sore of weathered and rotting 2x4s. We had to be careful where we walked or you just might go through the floor boards. A couple of more broken down steps and you were on a dog ruined little patch of grass. The rest of the upper backyard consisted of a large landing of asphalt and a 15' x 10' driveway of asphalt going down to the lower ground level. The entire back yard is surrounded by a tall retaining wall and entirely underneath it was a massive over-powering 40' long 4' high and 3' wide collapsing Allen Block flower garden. At least we think it was designed as a flower garden, it had a couple of barrel cedars planted in the corners. We decided to rip out EVERYTHING! Taking out the Allen Block wall seemed like too big of a project for my husband and myself. They had to be carried down to the lower level and each block is a lot of weight. We decided to list the blocks on a classified site as a give away, if you came and hauled them away. There was a lot of dollars in blocks, so they actually disappeared the first day. We removed all the clay, rocks, and broken concrete from the flower garden. What we weren't expecting was to find was the footings from the retaining wall sticking out 3' off the lawn level and 2' into mid-air. Oops, that wasn't in our origninal plan. We decided to incorporate a 3' cement wall 2' from the tall retaining wall to retain the soil under the footings. Almost the same thing that was there but not so wide and at least it was standing up straight. We removed a truck full of contractor's debris with the bad soil. Tore out the old-deck and hauled that away. We removed all the asphalt, another couple of truckloads there. We brought in 4 gravel truckloads of topsoil to build up the ground level to become a walkout backyard and lowering the 3' wall down to a nicer level. We hired a team to lay forms and pour a 30' kidney-shaped deck and a 4' wide curved set of stairs going to the lower level. We went with a two-toned stamped concrete. We brought in a gravel truckload of 3-foot rocks, which hubby (single-handedly) rolled up the incline to build retaining planting platforms on both sides of the steps. From there it was just the fun stuff. 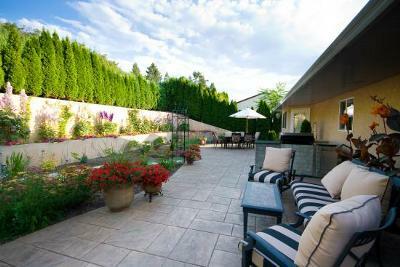 We added an island barbeque, a dining patio set and a living area patio set, planted hundreds of flowers and shrubs. We love the new deck and backyard and are so glad we went to the trouble. It wasn't cheap, but it was entirely worth it. The stamped concrete is the only way to go! Easy to take care of and it is gorgeous. What a clean looking patio. I love the look of that stamped concrete. Looks like real tiles. A lot of work but a great result and a super useful outdoor living space. If you have a few more pictures that would be great to show off the rest of the deck area and maybe some before photos.